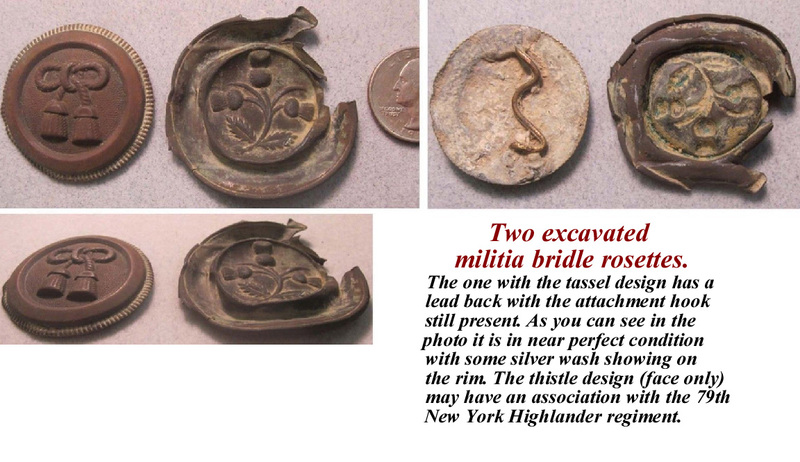 Two excavated militia bridle rosettes. The one with the tassel design has a lead back with the attachment hook still present. As you can see in the photo it is in near perfect condition with some silver wash showing on the rim. The thistle design (face only) may have an association with the 79th New York Highlander regiment. 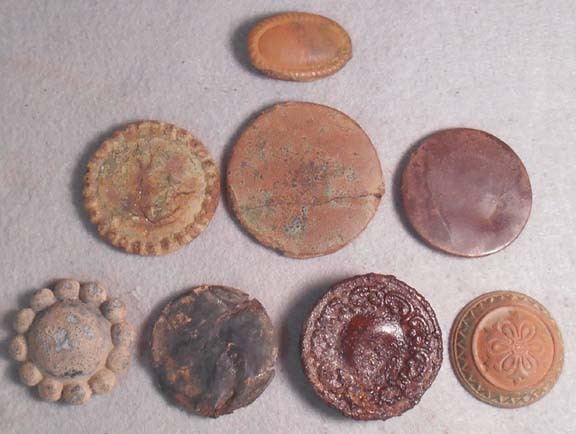 Eight Rosettes Dating from Antebellum to Civil War Period. 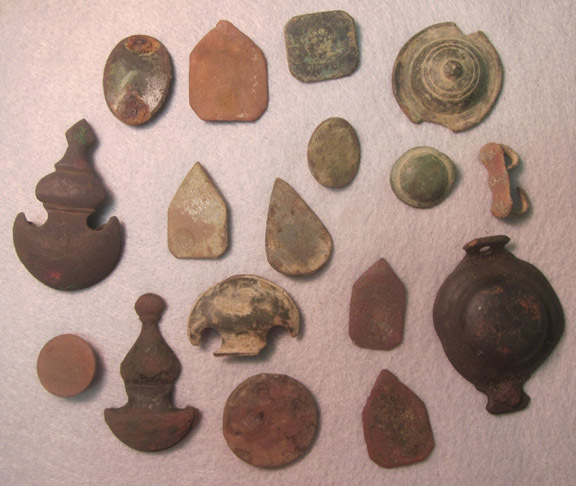 Some of these neat pieces have lead backs; others are tin backed. Pair of circa 1900 brass bosses. 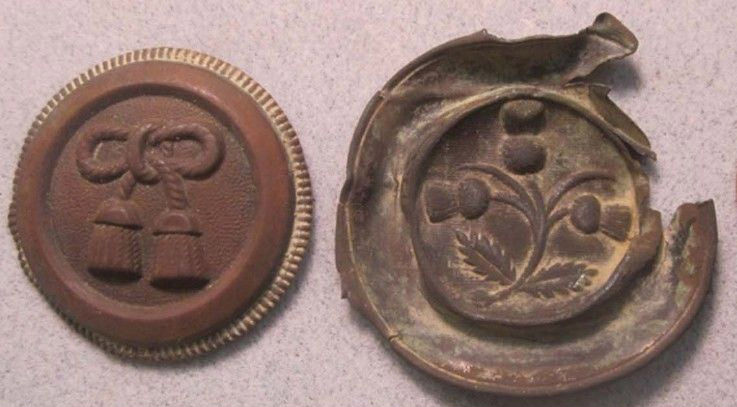 Pair of circa 1900 brass bosses that have been cut from a horse's bit. Pair of Model 1911 US Cavalry Spurs. 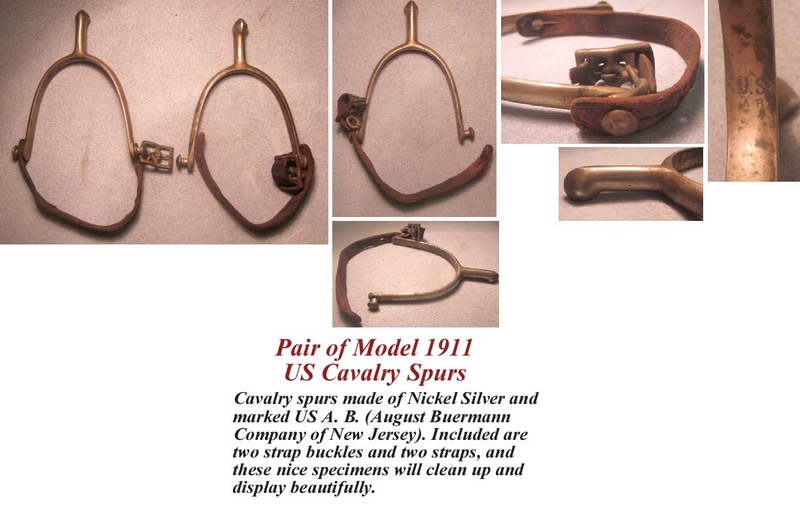 Cavalry spurs made of Nickel Silver and marked US A. B. (August Buermann Company of New Jersey). 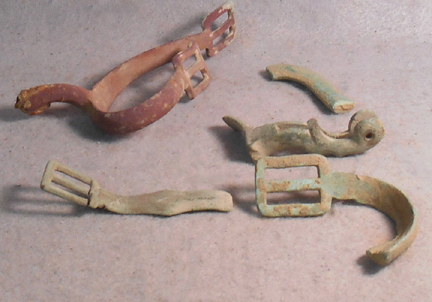 Included are two strap buckles and two straps, and these nice specimens will clean up and display beautifully. U.S. Spur and Spur Remnants. 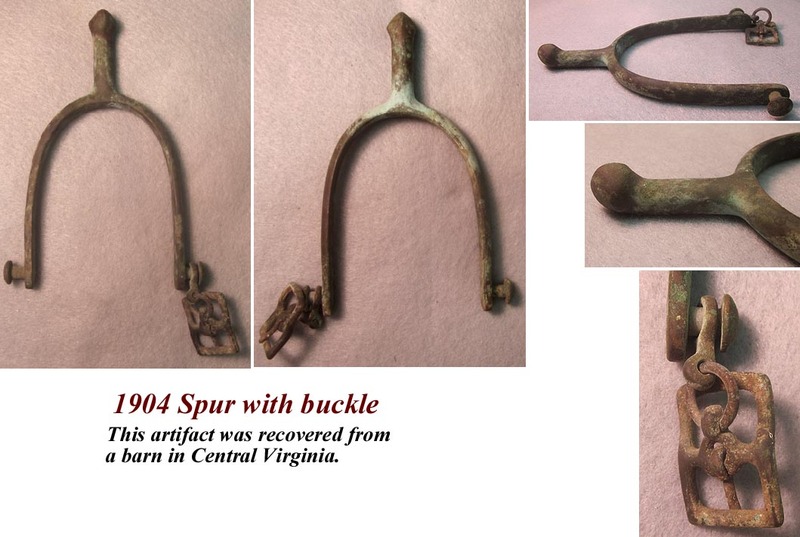 These spur remnants were recovered in Eastern Virginia. The Model 1859 Union spur has a cast-in follate design and is complete (except for the rowel), though it is considerably bent. 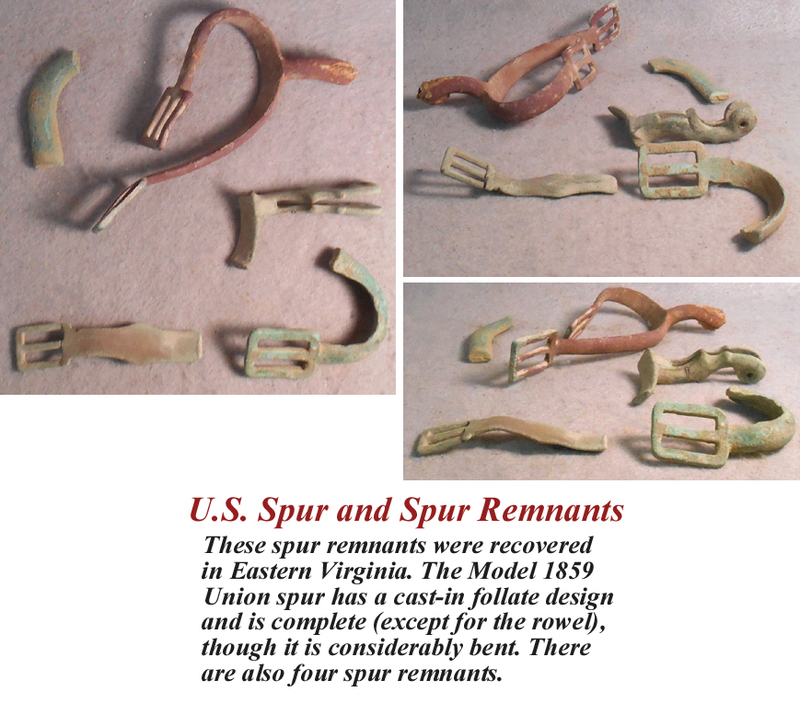 There are also four spur remnants. 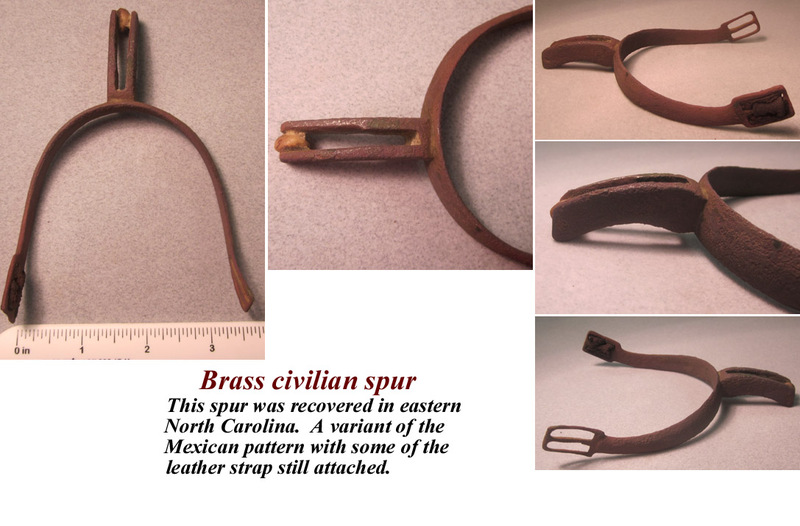 This spur was recovered in eastern North Carolina. A variant of the Mexican pattern with some of the leather strap still attached. Silver plated lead filled rosette. 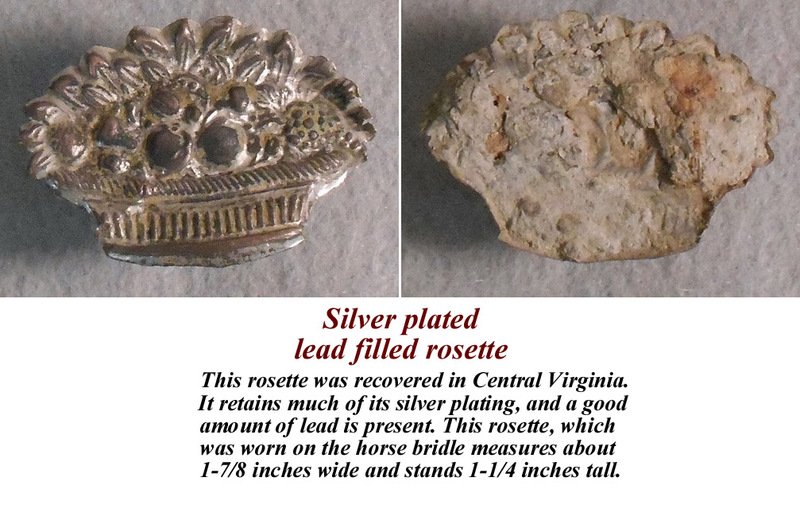 This rosette was recovered in Central Virginia. It retains much of its silver plating, and a good amount of lead is present. This rosette, which was worn on the horse bridle measures about 1-7/8 inches wide and stands 1-1/4 inches tall. 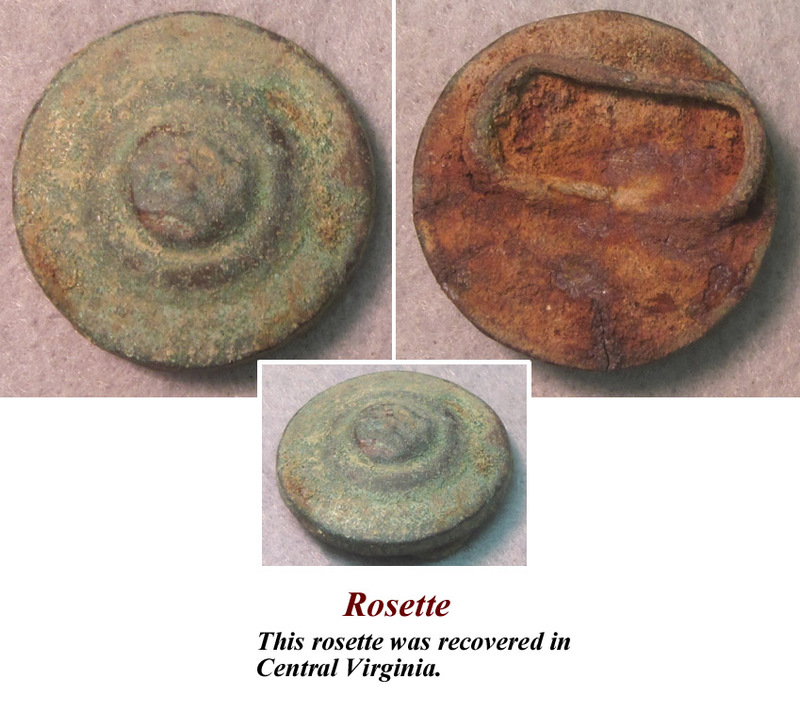 This rosette was recovered in Central Virginia. 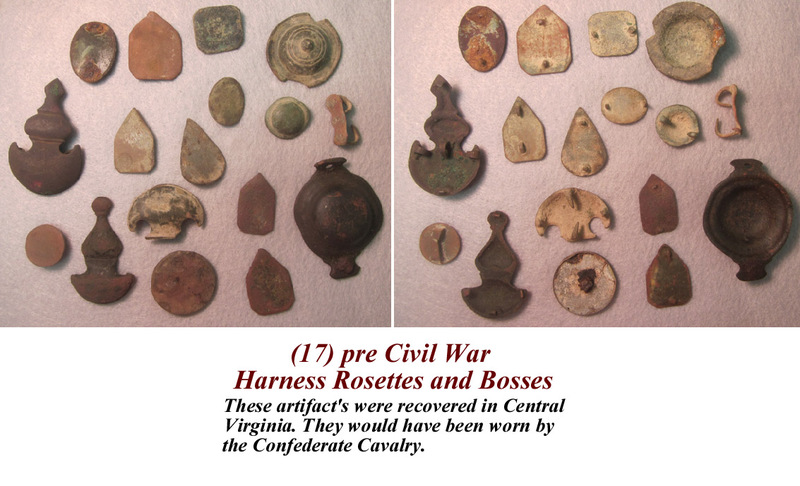 (17) pre Civil War Harness Rosettes and Bosses. 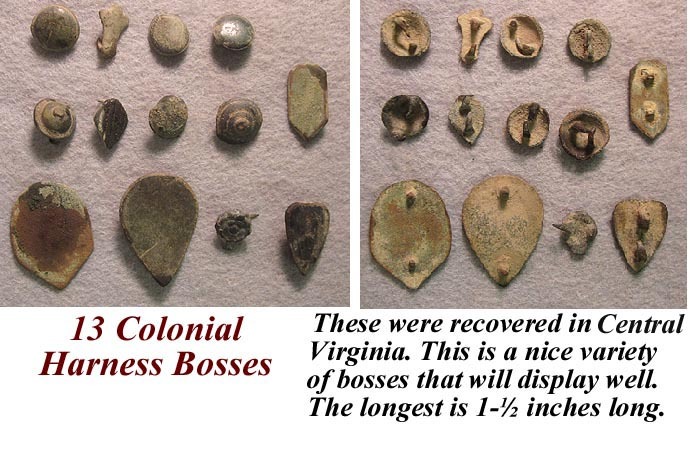 These artifact's were recovered in Central Virginia. They would have been worn by the Confederate Cavalry. 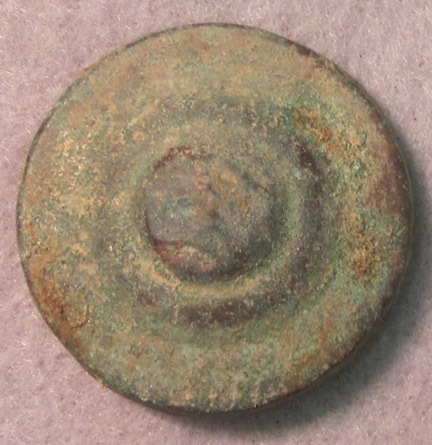 Large Civil War Period Brass Rosette. 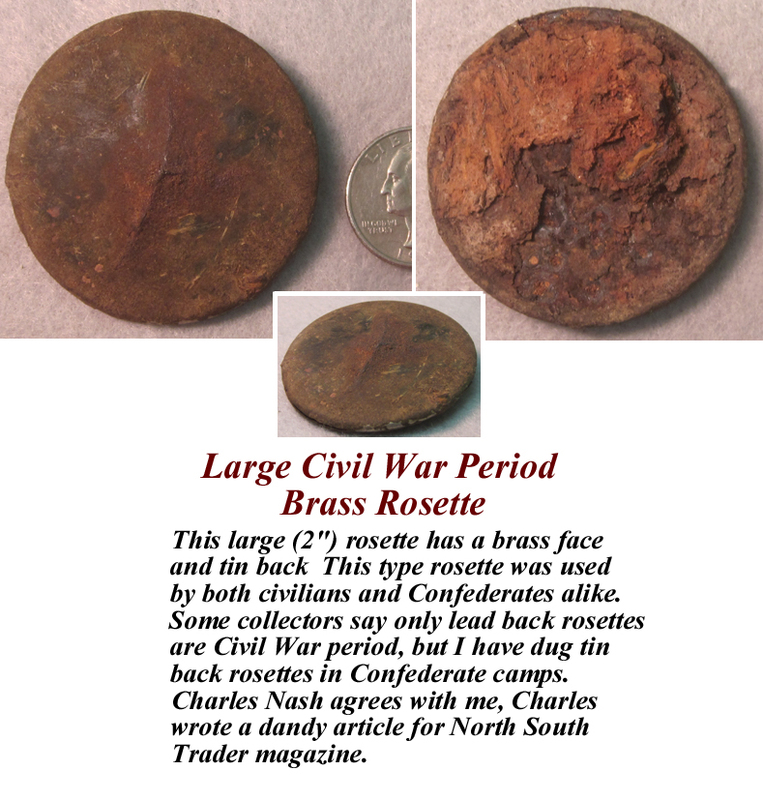 This large (2") rosette has a brass face and tin back This type rosette was used by both civilians and Confederates alike. 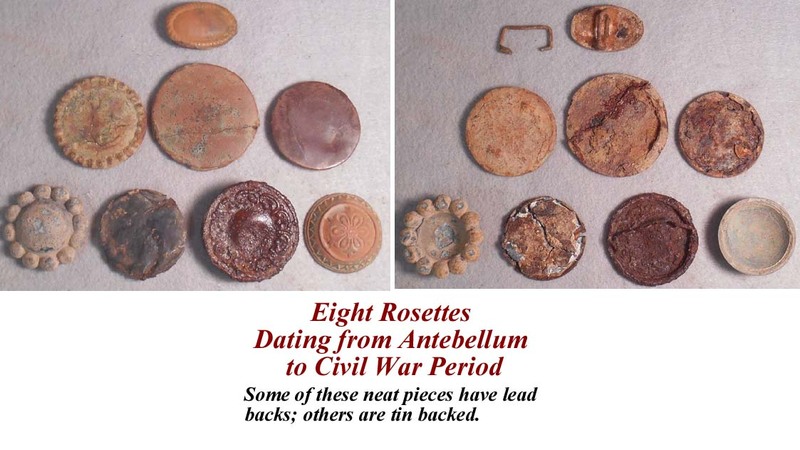 Some collectors say only lead back rosettes are Civil War period, but I have dug tin back rosettes in Confederate camps. Charles Nash agrees with me, Charles wrote a dandy article for North South Trader magazine. 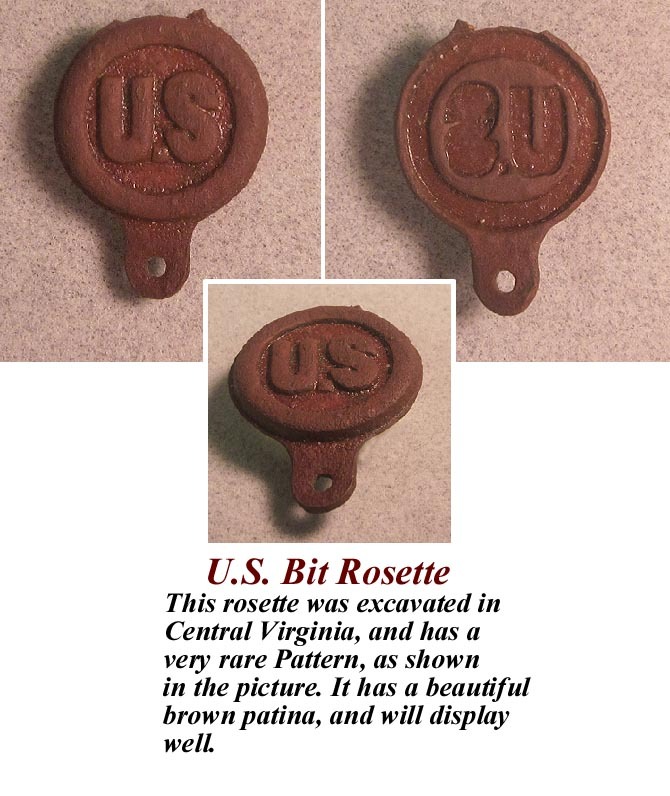 This artifact was recovered from a barn in Central Virginia. 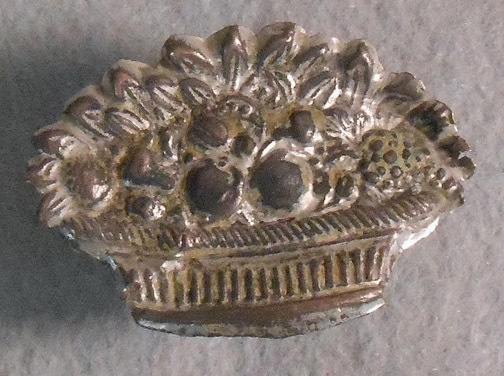 Civil War period Curry Comb. 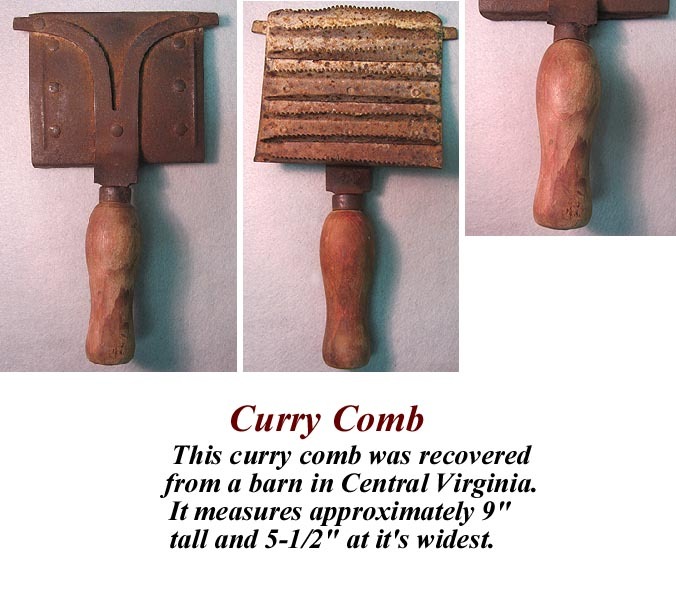 This curry comb was recovered from a barn in Central Virginia. It measures approximately 9" tall and 5-1/2" at it's widest. 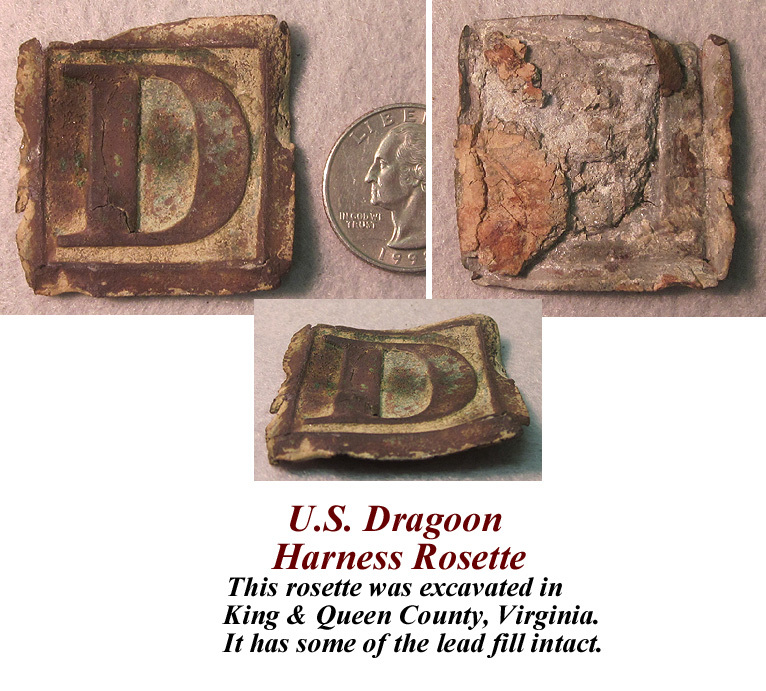 This rosette was excavated in King & Queen County, Virginia. It has some of the lead fill intact. 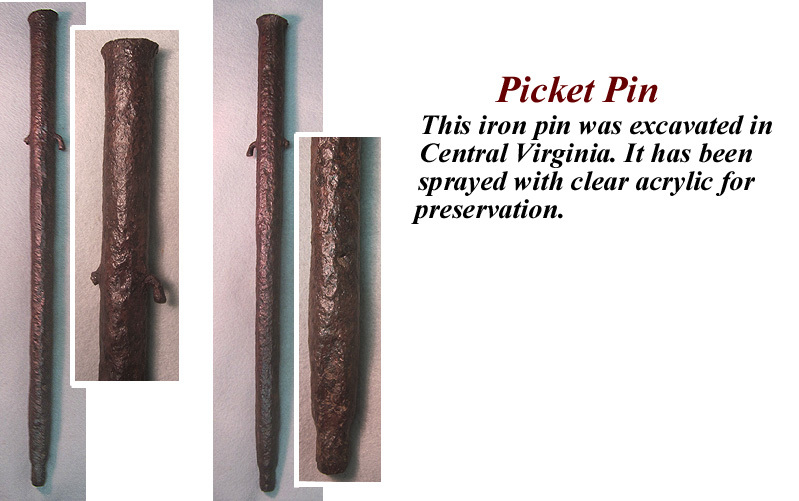 This pin was excavated in Central, Virginia. 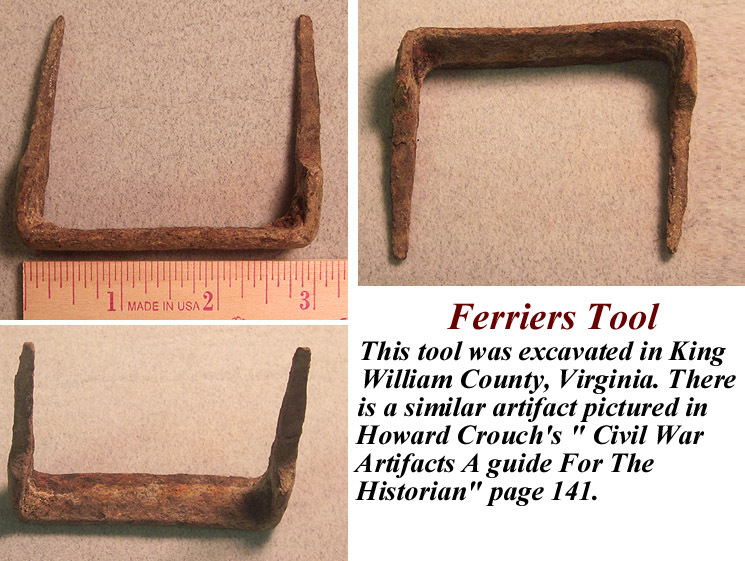 This staple was excavated in King William County, Virginia. Civil War Artifacts A guide For The Historian page 141.
and has a very rare Pattern, as shown in the picture. It has a beautiful brown patina, and will display well. of bosses that will display well. The longest is 1-½ inches long. 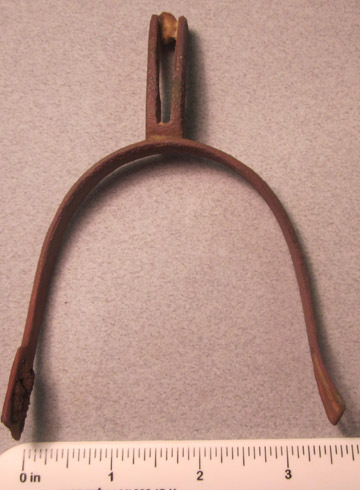 Civil war period militia martingale device, lead filled, excavated at the furious Cavalry fight at Haws Shop, Virginia. 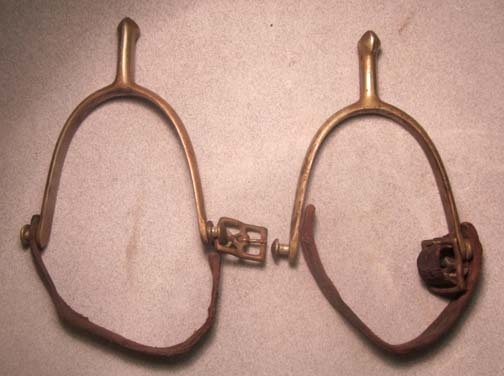 The devices were worn on saddle and horse harnesses and blanket straps. 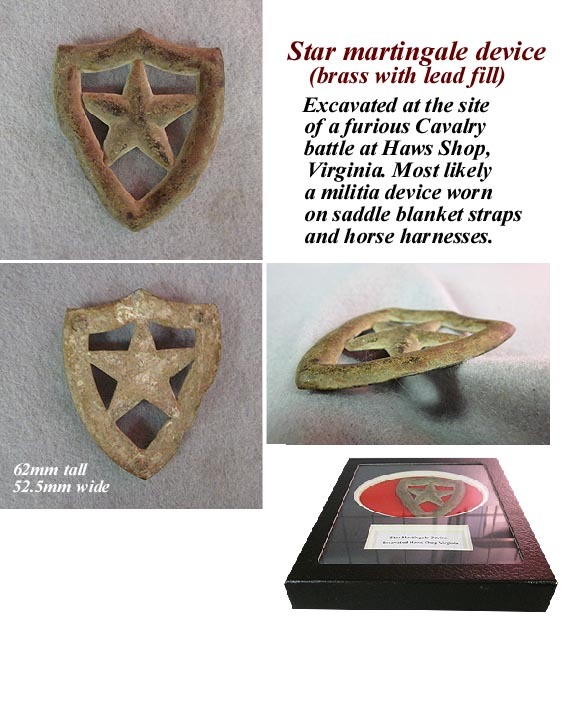 While many people say they are Texas saddle shields, I say they are not and more likely they are militia. Your purchase includes a Sgt. Riker case with mat and label.